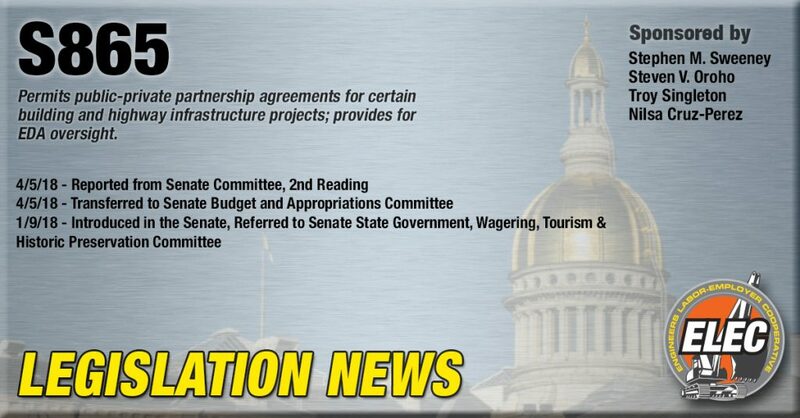 The bill establishes mechanisms to allow public-private-partnerships for various building and highway infrastructure projects in New Jersey. Specifically, the bill would allow for a public body (State, County or Municipality) to accept solicited, or unsolicited proposals through public/private business arrangements between the public body and one or more private entities. The public body would be authorized to utilize private capital financing, through the use of a public-private-partnership, to fund viable projects while encouraging competition and further delivering cost effective means of financing construction projects in NJ. Permissive contracting tool that further amends public contracting statues to allow the use of P-3’s. Requires that contractors engaged in a public-private-partnership obtain NJ-DOLWD contractor registration, NJ-DPMC or NJ-DOT classification and/or prequalification. Creates two-tier project development process which 1). Allows the State or any of its instrumentalities to solicit private businesses to engage in delivering building and highway infrastructure projects through a public-private-partnership, and 2). Allows the State or any of its instrumentalities, Counties and Municipalities to utilize a lease/purchase modified public-private-partnership model to finance smaller-scale projects over a longer duration. Requires project approval and oversight by the State. Statute references of passed laws (Misclassification Law, Public Bond Act, etc.). $10M. Project threshold for public body to utilize P-3 delivery method. “lock-box” account language to ensure private financing for the project is secured. Prohibits contractors from having financial stake in projects they’re engaged on. Prohibits “Bundling” of P-3 projects.